Firstly, I'd like to point out that I didn't deem this cider 'Incredible'. That is what a certain Mr Oliver calls it. It was nice in my book. Probably the nicest mulled cider I've ever had. 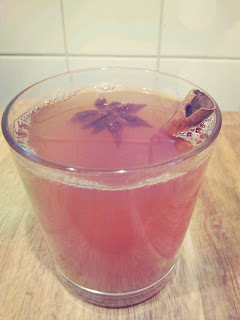 But then I've never had mulled cider before so I don't have anything to compare it to. I'd love to put my trust in him, however, I do have a small bone to pick with this recipe. Take a look at the recipe on his website (I came across it in a free Christmas pull out in my mum's newspaper some weeks ago). Look at the picture. The cider looks a lovely golden colour. Now look at my picture. Okay, so although I do have my own pro photographer to hand (he was busy eyeing up the remains of the coconut ice and Nutella fudge, my photography skills aren't brilliant, but mine is a lovely pinky colour. This is down to the pomegranate in the drink. Pomegranates have gorgeous jewel-red seeds. I swear that Mr Oliver's mulled wine has never been near a pomegranate. I'm sure you can't get yellow ones. So if the picture on his website (which was also in the pull out) is really of the cider then why is his not pink. Something fishy going on here.... Maybe I should call the fraud squad or something...? Anyway, it's a really good, winter warming recipe. I'm not a drinker so this is quite high praise. I really can't hold my alcohol. The family joke that I only need to sniff a barmaid's apron and I'm drunk. This is strange as my mother can pack away a bottle of wine like it's Evian. The husband loves this as it means he's always got a designated driver on the rare occasions that we go out. I usually have a mulled wine if I'm out somewhere festive (again rare) but red wine always gives me a stonking headache so the idea of cider was much more appealing. I do, every now and again, have a cheeky cider (although not real West Coun-ree Scrumpy as befits the roots on one side of my family). I'm not a fan of cinnamon, liquorice (from the star anise) or cloves. But together they are really harmonious and turn some pretty average supermarket Scrumpy into something quite special. Pour all of the cider into a large pan on a low heat and warm it through for a few minutes. Add all of the spices and fruit juices and turn the heat up. Once boiling, turn down to a simmer and leave to tick away for 5 to 8 minutes. As everything infuses you'll get the most delicious layers of flavour. Just because this is a glorified Christmas punch doesn't mean you don't taste it like you would a sauce. Pay attention and add a few tablespoons of sugar to taste. You don't want it to be sweet; you just want the sugar to join up all the different spices so you get a harmonious taste. 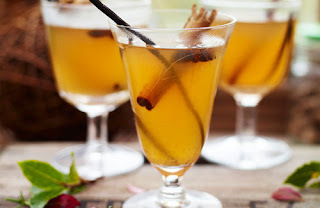 When you are happy with the flavours, ladle the mulled cider into glasses or mugs and serve while warm and delicious. Personally I think it's nice to leave bits of spices floating around in the cider when you serve it but if you want yours clear and perfect just pour it into the glasses through a sieve.